This is Rhonda, and I am going to be blogging Tom’s journey to the summit of Mt. Vinson Massif in Antarctica. As everyone knows, he left Tuesday for Punta Arenas, Chile. Once there, he met up with his guide, Dave Hahn, and the other team members. For the past few days, they have been enjoying their surroundings, getting to know one another, and checking gear. They have been briefed on things to expect as the climb gets started. Weather will be the biggest obstacle they will face. In fact, it has already proven to be true. The plan was to leave Chile early this morning for the five hour flight over. They were briefed last night on the conditions and given the thumbs up to go…so with the gear already packed onto the plane, Tom was feeling the excitement of the adventure ahead. After arriving to the airport a little after 6:00am this morning, they were informed that the winds were too strong to land at Union Glacier. With fingers crossed and lots of praying, we hope that tomorrow is good to go. I hope you will be a part of this exciting climb to the top of the coldest place on earth by following my updates on Tom’s Facebook page. Great news! Tom made it to Antarctica! They left Punta Arenas, Chile this morning around 8:00am. By the way, the time zone he will be in is just two hours ahead of us. Interestingly, the continent of Antarctica has eight time zones! Also, it is daylight there 24/7. I spoke with him before he boarded the plane. He was excited and anxious at the same time. There were about 50 passengers onboard…three small teams climbing Vinson Massif and some doing other South Pole expeditions. They boarded a Russian llyushin ll-76 cargo plane for the five hour flight to the blue ice runway at Union Glacier. The flight over was going to be a cold one! They had to dress in their climbing clothes and boots to be ready for the extreme arctic temperatures, but also because the temperature inside the plane would be lowered to the freezing point. This is so their bodies aren’t shocked with the frigid cold when they get to Antarctica. Best of all, I spoke with him after he got there! He called this afternoon from his SAT phone. He sounded great and the signal was very clear! He was in awe of his surroundings. He said there were no words to describe it! It was a beautiful, clear day! The flight on the Russian cargo plane was amazing as well! As I was writing this post, Tom called! I can’t tell you how great it is to hear his voice! They are at the base of Vinson Massif! They flew over on a Twin Otter with skiis this evening. Again, he says it is incredible! They spent the last couple of hours setting up camp. The plan for tomorrow is rest and maybe do some hiking. I’m so happy I could let everyone know he is well, and he’s there! Please continue to follow Tom’s incredible journey and leave messages for him. He may not get them now, but he will when he gets back. Please keep him in your thoughts and prayers! Thank you! After all day waiting to hear from Tom, he finally called around 8:30 this evening. I am so grateful to have any communication at all with him. He said it was a very busy day! They did some training this morning and then headed half way up to Camp 1 to cache some equipment and then back to Base Camp. If all goes well, the climb will begin tomorrow. He said it was difficult to sleep last night. Even though the sun doesn’t set there during this time of year, it does go behind the mountain making it even colder. The temperature when they went to bed was -26F degrees. His sleeping bag is good for -20F degrees, plus he sleeps in multiple layers and his parka jacket. He stays relatively warm, he said, but it’s very uncomfortable. Everything is difficult because of the extreme cold. Think about having to take care of personal business under these circumstances…if you know what I mean! Even making a phone call, and he takes his gloves off, it’s no time before his hands start to freeze. They did have a hot meal of hamburgers tonight, and they are drinking lots of hot cocoa. I guess his Yeti mug is being put through the test. He did ask for prayers…for rest, for good weather, and strength. They are about two days behind schedule. The sooner he gets to the summit, the sooner he gets back. To everyone following, thank you for your well wishes. I apologize for not getting this out last night. I spoke to Tom a couple of times yesterday. They made it to Camp 1! The first call came after they arrived at camp. He said it was a difficult day due to carrying a backpack and pulling a sled. He had to do this as well when he climbed Mt. McKinley in Alaska, but this time seemed harder. He was exhausted, with a few aches and pain, and they had to set up camp so we only spoke a couple of minutes. The next call came a few hours later after a little rest, and he sounded better. Today’s plan is to rest! The cold is brutal, and he expected it; however, I don’t think you can be prepared for this kind of arctic cold. He is encouraged by your prayers and asked to keep them coming. I should have a post later tonight updating on his day today! Good evening, everyone! I just spoke with Tom! What he thought was going to be a rest day today turned out to be anything but. They slept in until 10:30 this morning. He said that’s about when the sun rises above the mountain. It’s really too cold to go outside of the tent before that time. I asked him if he knew what the temperature was, but he didn’t. He did say that it’s colder the higher they climb. After breakfast, they took some equipment up to Camp 2 and then came back down. This is to make the load lighter when they make the actual climb up to set up the next camp. He said the climb today was very steep and scary at times. Tomorrow will be a rest day before they head up to Camp 2 on Friday. Just to give you an idea of where they are….Base Camp is at 7,000ft and Camp 1 is 9,200ft. The distance between the two camps is 6.5 miles, and they made it in just over five hours yesterday….carrying a backpack and pulling a sled! Wow! He is grateful for your thoughts and prayers! And that goes for me, as well! Thank you! Well, all’s quiet on the arctic front! I spoke with Tom earlier today, and it was to be a rest day. He sounded great! Tomorrow will be a long day heading up to the next camp at 11,200ft. However, he did say that they were waiting for reports on the weather because they were told it wasn’t looking good. He said he would call later today, and so far, he hasn’t. I’m certain he’s well, but I am always anxious when I don’t hear from him. I am grateful to have this connection with him, though, no matter how brief. When he was on McKinley three years ago, his SAT phone stopped working a few days into the climb. That was a very long two weeks, trust me. Please pray for good weather tomorrow and if they do head higher, pray for strength in mind and body. He did tell me that yesterday when he was coming down after caching some of their equipment close to Camp 2, he was thinking about how hard this is, not only physically, but emotionally. I know he is so strong in both, and he challenges himself to do things most of us would only dream about. He turns his dreams into reality, and I greatly admire that about him. I can only imagine the incredible things he has seen and done by pushing himself beyond his fears. Not only does he do this for himself, but he hopes he inspires others to reach for their dreams….no matter what they are! Thank you to everyone who is following this journey! Hi everyone! I was in the middle of writing this post when Tom called! It was actually the second call of the day! He called this morning around 11:00, and as usual was very brief. In fact it was cut even shorter because he was called to a meeting. After a much needed rest day yesterday, they were hopeful to be climbing up to the next camp today, but there was bad weather up near the summit. It was a strong possibility they would have to wait, even through the weekend. His guide is very conservative, which is a good thing. You don’t want to go higher knowing there could be bad weather and have to wait it out in the middle of it. When we hung up, he said he would call and let me know one way or another. I have been anxious all day since I had not heard anything until a short while ago. The good news is, things seemed good enough to head towards the next camp. After we talked, he said they had about an hour to break up camp and be ready to climb. At this point, they are climbing with the fixed ropes. They were almost at the top of the line near camp when they took a break (on the side of steep cliff). The bad news is, when one of his team members took off his backpack to get water, as everyone did, his backpack rolled all the way down spilling his supplies. They had no choice but to go back down and retrieve everything. Heartbreaking!!!! When he called, they had just made it back to where they started….Camp 1! He was frozen and exhausted….physically and emotionally. His teammate was very emotional, to say the least. Tom felt so bad for him, as well as the whole team. Now it is uncertain whether they will be able to climb tomorrow, mostly because they are all completely worn out. He said he didn’t think he would be able to climb. The weather is still a possible obstacle, as well! Please keep them in your prayers for the coming days! We are so grateful them! Thank you! Happy Saturday Evening! After a long, arduous, and disappointing day yesterday, Tom and the team have spent today recuperating. As unfortunate as yesterday was, they are counting their blessings to be below the storm that is above them. The other team climbing alongside of Tom’s team made it to Camp 2 last night. This camp is at 12,200ft and the last camp before summit. They attempted to reach the summit today, but was turned back because of bad weather. They will be waiting out the storm in the middle of it. Tom said he was grateful they ended up back at the lower camp. Their guide, Dave, had to ski down to Base Camp to pick up extra food, however, because they may be there a couple of days. He said Dave is an amazing man and mountaineer, and he feels honored to be climbing with him. Thanks for all the well wishes and prayers! Good evening, everyone! It’s been a rough 24 hours on the mountain! The storm that was above has now reached Camp 1 where Tom’s team is. It came in around 6:00 last night. They prepared for this possibility by fortifying the snow walls around the tents to help block as much wind as possible. They had sustained winds of thirty and forty miles an hour with even higher gusts. When I spoke with Tom this morning, there had been little to no sleep because of the noise and the winds whipping the tent. They cannot leave their tents for any reason due to exposure. The food and water they have are what is packed in their backpacks. Despite the storm, the SAT phone signal has been great, and he sounded in good spirits. I could actually hear the wind howling in the background. Tom has been here before waiting out a blizzard on the side of a mountain. When he was on Aconcagua in Argentina, there was a three day blizzard. I asked him how this one compared, and he said this was worse. If anyone is wondering what he may be doing, well, he has his journal, books, and music on his phone. The good news is maybe the storm will be moving out tomorrow. His guide is getting regular weather updates. Let’s hope and pray this happens! On a more positive note, I want to share a unique opportunity Tom had this morning! He participated in a conference call to Zurich, Switzerland to an event called The Titan Summit. How appropriate, don’t you think! This is a leadership event of business CEO’s hosted by an author and international leadership speaker, Robin Sharma. Tom and Robin share a similar message, and Tom’s read his books and followed his journey. They connected a few months ago, and Robin asked him about speaking at the event. Obviously Tom had other plans. Tom had an idea about calling into the conference from the mountain. Well, he pulled it off this morning! Some of you know that Tom has a dream to share his story and inspire others to pursue their own dreams….no matter how big or small. Most of the time, fear is the reason we don’t. I have witnessed him tell his story, and I can tell you that the reaction of others has always been one of being inspired. Part of that, I believe, is that Tom doesn’t just talk about his dreams, he lives them….even when he is the middle of the fear, like he is at this very moment. It just goes to show you what can happen in the midst of a storm! We again thank you following Tom’s journey and for the positive thoughts and prayers you are sending him and the team. Let’s pray the storm passes soon, and they can move higher and then on to the summit. The sooner they reach the top, the sooner they will be home! Good News…the storm is over, and the sun brought some much needed warmth today! However, it was worse than we thought. They had reports that the winds exceeded 70 and 80 mph. These are hurricane force winds…unimaginable! With the temperatures already in the negative degrees, I can’t fathom how cold it was with those winds. Tom didn’t have any idea. The camp suffered significant damage. The snow walls they had built to protect the tents were demolished. To give you an idea of those walls, they are blocks of ice and snow that are cut out like bricks. These ice blocks are heavy enough to make them difficult to lift. Tom and his teammate’s tent was destroyed. The wind was so loud and the tent walls snapping sounded like a machine gun. They have earplugs with them, but they were useless. I didn’t know this until today but during his phone call to Switzerland yesterday morning, he was unable to hear himself as he spoke to the audience. Tom said he didn’t sleep for 36 hours. Finally, about 5:00am this morning, as the storm subsided, he fell asleep. Despite all of this, he sounded in good spirits. The team regrouped and started rebuilding camp. Dave skied down to Base Camp to get a new tent and a few supplies. They had a hot meal this evening and were hopeful for a much better night of sleep. There is a possibility they will move higher tomorrow. There was another team at this camp that suffered damage as well. The team at the higher camp was okay, although they don’t know how bad the storm was for them. I know I say this with every update, but please keep praying. And it’s not just me asking, he is asking for them and is very grateful. Thank you! It was a long day waiting for a call, but I just heard from Tom! I assumed since I had not heard from him earlier in the day that they must be pushing for the next camp. I was right! He said it was not decided until this afternoon to go for it, but Dave thought it was their best opportunity. It was a long, difficult day, but they are now at High Camp and grateful to be there. They set up camp and had a hot meal and hot drinks. Believe it or not, they are going for the summit tomorrow! Yeah!!! He thought there would be a day of rest before heading to the top, but Dave wants to take advantage of the good weather up there at the moment. It will be a long 12 hour day for them, especially after a grueling day today! Please pray for strength, safety, and good weather as they attempt the reach the highest point at the South Pole! Stay tuned tomorrow to find out if they are celebrating success! HE MADE IT!!!! I just spoke to Tom from the top of Mt. Vinson Massif! He was so emotional he could hardly speak! His tears were freezing to his face! He said the weather was not great. I asked how he was, and he said he was exhausted and cold! It will be 5 or 6 hours before they get back to camp. If I hear from him when he gets back, I will make another post. Thank you all for the well wishes and prayers sent his way! What an amazing story he will have to tell! Tom and the team are making their way down to Base Camp! I spoke with him this morning. They made it back to High Camp late last night, had a meal, and went straight to bed. It was a very restful night after a day of great success and hard work. Yesterday started early at 7am to determine if it would be a good day to go for the summit. They woke up to a lot of fog and light snow, but very little wind. After breakfast, they decided that they would go for it! By about 9:30, they were roped in and ready to go! For most of the climb up, it was like a whiteout. They stopped to take a break every hour or so, and the higher they climbed, the colder it got. They encountered a few light winds which could have face freezing possibilities, and then suddenly as they broke through the clouds at the top, the winds calmed and the sun was peeking through! This was at 5:30pm. They spent 30 minutes at the top celebrating their success, taking pictures, and being grateful for what they had gone through and how far they had come. As I mentioned in the last post, Tom was overcome with emotion and joy! Words can’t express how proud and happy I was for him! It was equally special for me to get a call from him at the summit! I didn’t get one when he made the summit of Mt. McKinley because his SAT phone wasn’t working. This was something I will never forget! I am unsure of the plans as to when they are leaving the mountain. We spoke about it right after the storm, and he told me there were two flights leaving the mountain…one on the 7th and one on the 12th. I don’t know if that has changed since they will be back to Base Camp today. If it hasn’t, they will be there until Monday. I should know more tonight maybe. Thank you all for being a part of this incredible journey and for the messages and likes on every post. He will have a chance to read the posts and messages and see those of you who have been following when he gets back. There will be lots of pictures to share and some words of gratitude from Tom himself when he is home. Hi everyone! This will be my last post as Tom will be back in New York this week. When they reached Base Camp Thursday evening, there was a champagne celebration waiting for them. A perfect ending to an epic climb! They flew off the mountain in the Twin Otter over to Union Glacier where there was a community tent with hot food and hot drinks. He slept in his own tent, and even though the temperatures there were a little warmer, there was no escaping the bitter cold. It was still difficult to get good rest, but he was grateful for the accommodations. They were there for a couple of days due to unfavorable conditions for the Russian cargo plane to land. Once in Punta Arenas, Chile, a couple of hot showers and a warm bed never felt so good. I hope my posts have helped you feel like you were a part of the incredible journey with Tom. Most of us will never experience an extreme adventure like this, but we can get a small glimpse of it through Tom’s perspective…from the fear to the determination to ultimate success. Thank you for your support, well wishes, and prayers. In the coming days and weeks, we will be posting his photos. The team will also be sharing their pictures with each other. 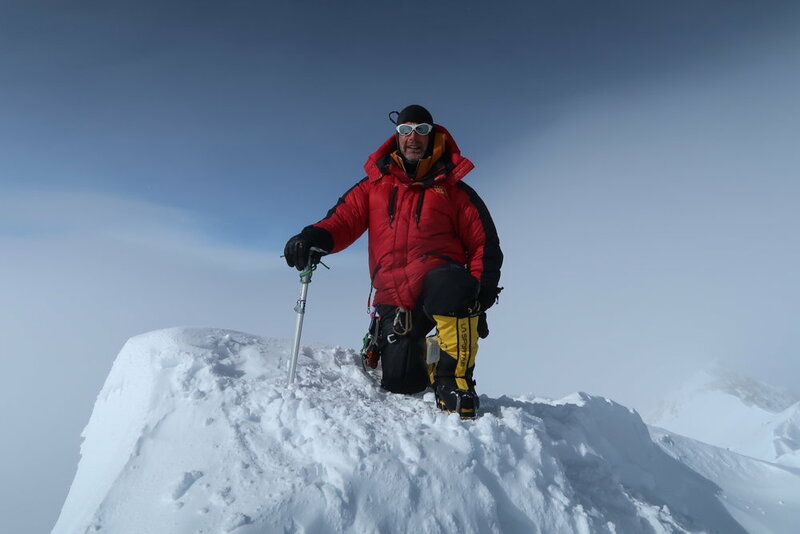 Here is a sneak peak…Tom at the summit!